Manitoba's landscape is divided into several different basins. A basin is defined as an area of land which drains into a major river system or water body. Basins in southern Manitoba include the Red River, the Assiniboine River, Lake Manitoba, Lake Winnipeg, the Saskatchewan River and the Winnipeg River Basins. Each basin is comprised of sub-basins, or watersheds. A watershed is a defined geographic area where all surface water drains to a common point. 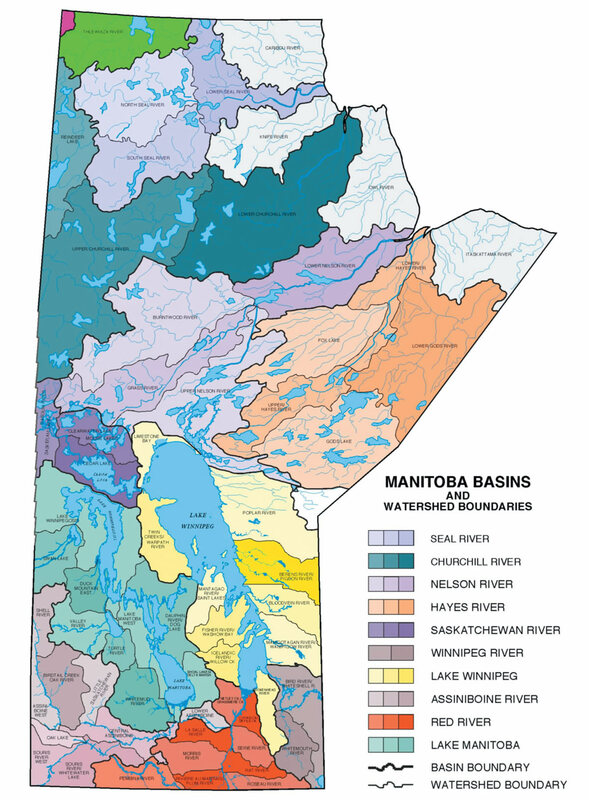 There are many watersheds in Manitoba, and each is categorized by which basin it belongs to. Manitoba recognizes the importance of bringing all perspectives from a watershed together to discuss how best to manage the land, water and biodiversity resources in a specific area. To do this, watershed management plans have been completed in many watersheds in southern Manitoba. To date, conservation districts have been appointed as Water Planning Authorities for the completed watershed management plans in Manitoba. For more information on watershed management planning, click here. Manitoba also works with neighbouring jurisdictions to manage water that spans our provincial and international boundaries. For more information on how we are working together in these transboundary watersheds and basins, click here. Below the surface, groundwater is available in a number of extensive bedrock aquifers and within sand and gravel aquifers of varying size throughout many areas of the province. Groundwater is a major source of water for private domestic use as well as for municipal, industrial, commercial and agricultural purposes. Groundwater also provides base flow to rivers and streams and contributes water to marshes and wetlands. Given ever-rising demand to use groundwater sources, it's important we have policies in place to make decisions around how to manage these important sources. For more information on how we are working with stakeholders to manage our aquifers, click here.